Yes, I know it’s May. 2016 has been an extremely weird year, and one of these days I’ll blog it. 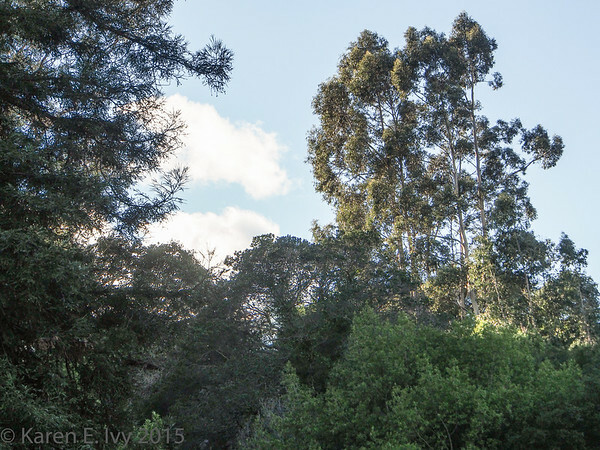 But I recently got the photos sorted, processed and uploaded from the walk I took around Lake Temescal, in the Oakland hills, on Christmas Day 2015. In a sense, this was the calm before the storm, because 3 days later, I came down with an awful cold (took 3 weeks to get rid of), which was the start of all the things that have gone wrong so far this year. But back to the lake. Here it is. Click on this or any other photo to go to my Smugmug account and see the whole collection. This was taken about 3 PM on a still, sunny day, not very cold. 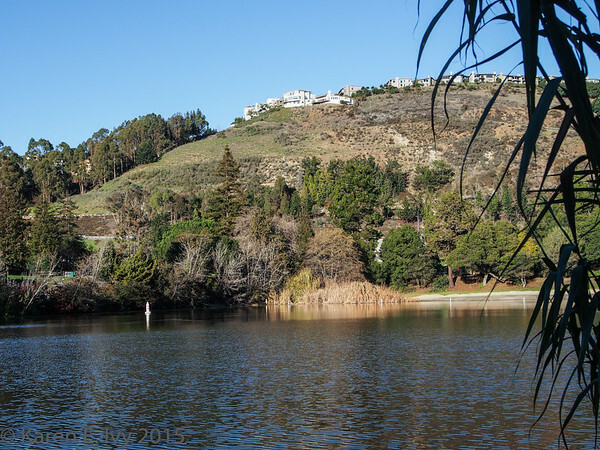 Lake Temescal, which is about a mile uphill from our house, is a rather small lake. My pedometer says it’s about 1 mile around, on foot. 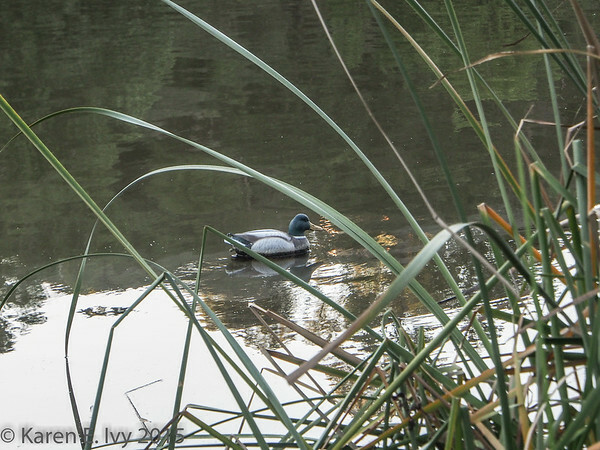 I decided to take the camera up, walk around the lake, and see what I could see. There weren’t very many people there, which is unusual; the lake is a popular picnic spot, and in summer you can usually swim off the little beach. As you can see from the houses on the hilltop, this is a very urban lake. It’s also squarely in the fault trace of the Hayward Fault. You can see the late afternoon sun on the trees at the top of the hill to the west; I spent much of this hike in the shade because of that hill. I don’t have a photo, because the plants weren’t in leaf, but you hike the western lake trail very carefully, because the hill is covered with Toxicodendron diversiloba – poison oak to you. 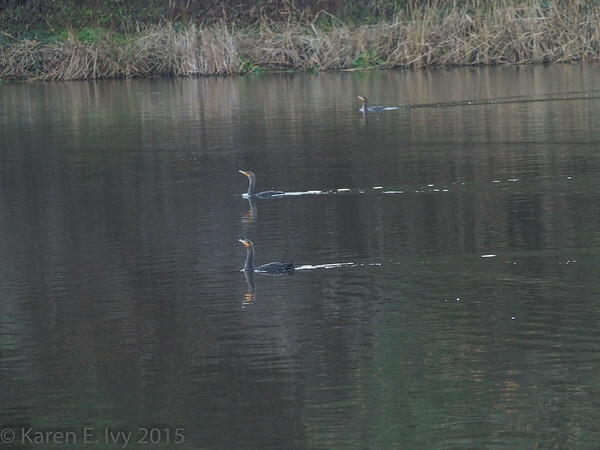 and some odd birds I’m proud to have identified as double crested cormorants – the swimming posture is very clear. 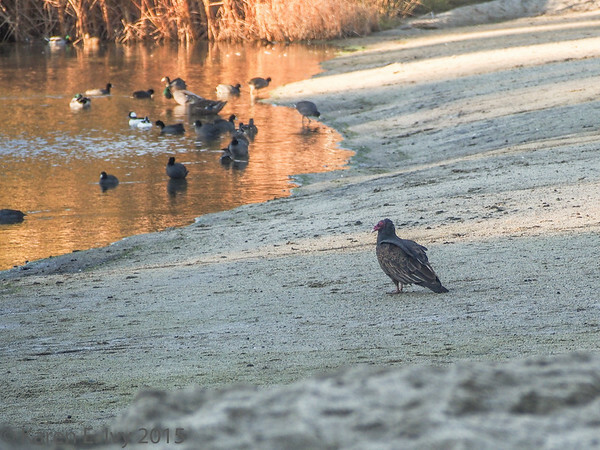 This is a turkey vulture, lordly surveying the rabble of coots, mallards, and other ducks swimming around in the shallows by the beach. I couldn’t see what he was until I got home and adjusted the lighting on the photos, because the shadows were so deep in the late afternoon – the sun was just going behind the western hill and I was shooting straight into it. You can just see his red face, and it’s clearer in a couple of other photos I got of him. 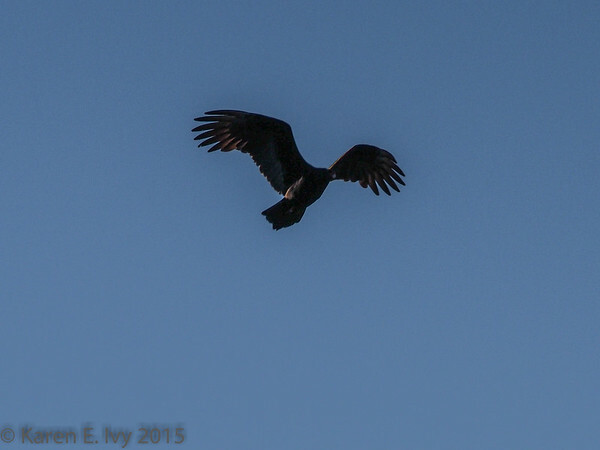 He walked around the beach for awhile, and then took off. The SmugMug gallery has other photos, showing the trails, the picnic lawn, and some nice mushrooms – I like mushrooms. Feel free to go take a look at a lovely, quiet day at the lake. 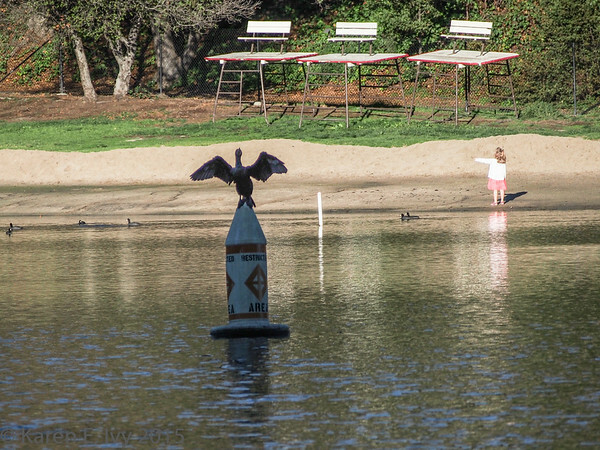 This entry was posted in Nature, Personal, Photography and tagged Birds, Lake Temescal, Oakland.